From the Nation's Favourite Cheese. 100% natural cheese. A smooth and mellow flavour in every bite, with 30% less fat. Made in Great Britain using British milk. High in protein and a source of calcium. Suitable for vegetarians. 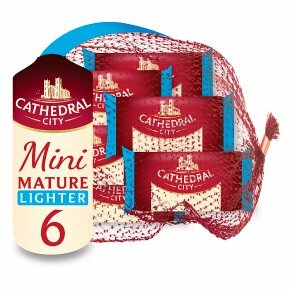 6 smooth and mellow mini Cathedral City Mature Lighter Cheese snacks with all of the flavour but 30% less fat * Make lunchtimes complete with these Cathedral City Mini Mature Lighter Cheeses, smooth and mellow with all the flavour but 30% less fat. Six individually wrapped healthier bite-sized portions - a perfect lunchtime snack for you or lunchbox filler for the kids. - From the Nation's Favourite Cheese - 100% natural cheese - A smooth and mellow flavour in every bite, with 30% less fat * - Made in Great Britain using British milk - High in protein and a source of calcium - Suitable for vegetarians * compared with standard Cheddar. Up and down the country, sitting splendidly in a sandwich or bubbling beautifully on toast, there's nothing quite like Cathedral City. That's because our award winning Cornish creamery only uses milk from dedicated West Country farmers to create our distinctive, smooth, creamy cheddar every time. Which is why we're proud to be The Nation's Favourite. All of our milk is 100% British and sourced from around 350 local dairy farmers in the South West, the heart of England's richest milk fields. Join us on Facebook/CathedralCity Established in 1966. By Appointment to Her Majesty The Queen Suppliers of Fresh Milk and Dairy Products Dairy Crest Limited, Surrey. Red Tractor Assured.